“This board is truly dysfunctional,” an La Plata Electric Association (LPEA)* member observed at this month’s Board of Directors meeting. The comment came after an extensive, heated debate about the Board’s standard of conduct, the definition of respectful conversation, and how to navigate their culture of divisiveness. Our take? After watching the discussion unfold, it’s clear that many, if not all, of our LPEA Directors regularly make emotional assumptions about the opinions of others without pausing to genuinely hear each other out. Currently, the board’s touchiest topic is how the declining costs of renewable energy (and rising costs of coal) should impact LPEA’s future – a discord that, based on last week’s meeting, clearly stems from a fundamental misunderstanding of renewable energy advocates’ motives. Tri-State Generation & Transmission** is a coal-intensive central power provider that generates and delivers electricity to 43 co-ops across the west. LPEA buys 95% of its power from Tri-State and has little say on how the power is generated. 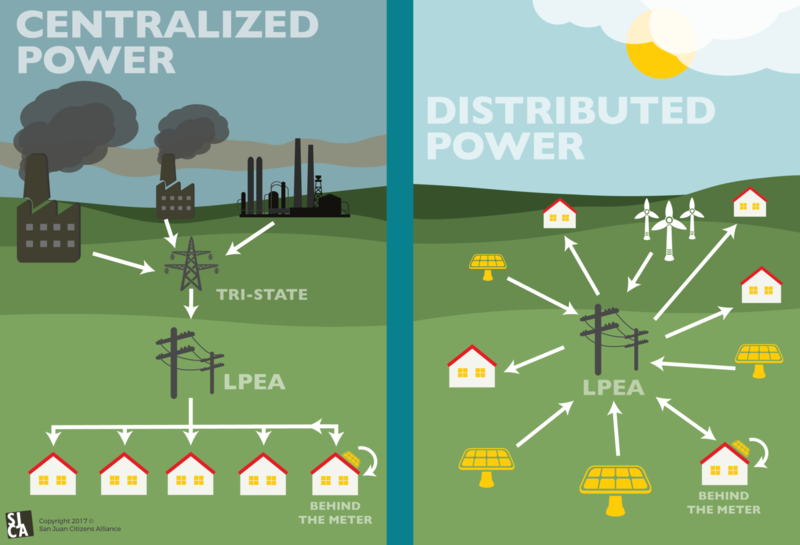 LPEA’s generates some of it’s own electricity through distributed power facilities that LPEA, not Tri-State, controls. Unfortunately, Tri-State’s contract currently limits LPEA’s self-generated distributed power to 5% of the co-op’s electricity usage, and LPEA has already maxed out that limit. Behind-the-meter systems are designed to power specific buildings. Think: rooftop solar. Only 2% of LPEA’s customers have installed their own systems. These small projects are usually connected to LPEA’s grid so they can sell excess energy back and pull power when necessary (when the sun is down, for instance). This electricity production largely does not count toward Tri-State’s 5% limit. Well, solar can provide power in all three of these structures. Tri-State, LPEA, and individual customers can all own solar installations. The problem is that half the LPEA board is stuck debating behind-the-meter solar when the other half wants to explore our options for distributed renewable power. At the November LPEA board meeting, Director Davin Montoya stated “Solar people want to come in here and get free energy and be subsidized. I don’t agree with that.” This demonstrates the discussion over rooftop, or behind-the-meter, solar has distracted some board Directors, allowing them to vilify all types of solar and blinding them to the possibilities of a distributed power path. It’s unfortunate that LPEA is framing the debate on renewable energy as rich against poor because what renewable energy advocates, on and off the board, really want is to figure out how to use declining renewable energy prices to benefit all of LPEA’s members. 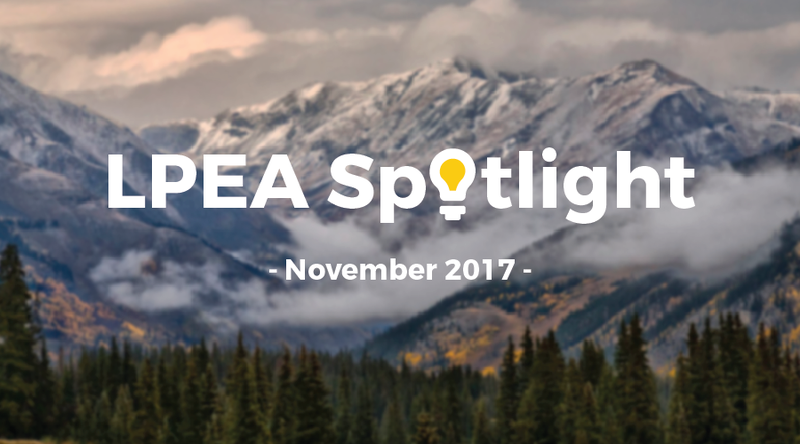 As exemplified by our neighbors in Taos, NM (See September 2017 Spotlight), LPEA could actually obtain a majority local, renewable energy through locally controlled, distributed power. Doing so would not only boost our local economy and protect the planet – but also, because LPEA would control the facilities, it would lower electricity rates for everyone. But Tri-State’s 5% cap on local generation paralyzes our ability to make this vision a reality. Until we find a way around the limit, we’re married to Tri-State’s increasingly high cost, coal-intensive rates. Right now, the LPEA board has big decisions to make concerning the future of co-op’s energy supply. LPEA CEO Mike Dreyspring made clear in his vision that coal is out, solar is the future, and we must find a way to shift the circumstances in our favor (See October 2017 Spotlight). We have the opportunity to start down the path toward the majority distributed renewable energy system that we envision – with lower rates, a cleaner planet, and a thriving local economy. But as long as LPEA’s board members view themselves as divided we’ll be stuck at the starting line. Awesome summation SJCA. Much appreciated! The article would be better if all the board members’ current positions were summarized. Hi Jim! Excellent point, however we can’t speak for the board members. You could definitely reach out to those who represent you and ask them! Thank you for the clear explanation. I am in favor of moving toward the vision of majority distributed renewable energy. I have attended an LPEA board meeting only once as an observing LPEA member-owner and I was surprised by the disrespectful tone set by Davin Montoya towards people whose views seemed to differ from his.